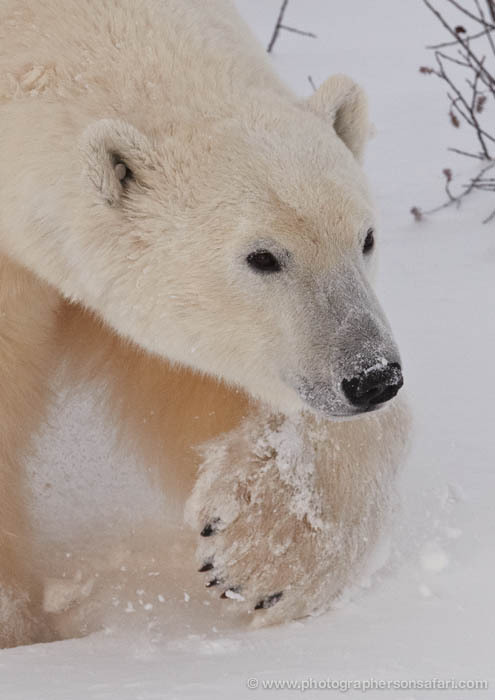 In the last of his series of special reports, Lawrence McGinty braves extreme weather conditions to travel to Cape Churchill to see the polar bears in their natural habitat. 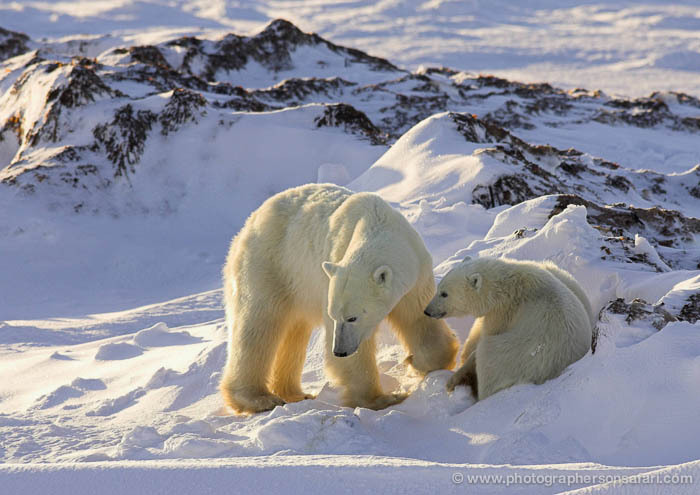 This is the time of year when the polar bears gather to wait for the sea ice to freeze so they can finally bring their long fast to an end. 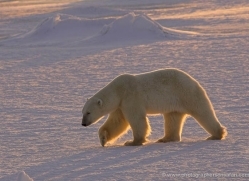 But thanks to climate change they now wait longer for temperatures to drop and to feed. 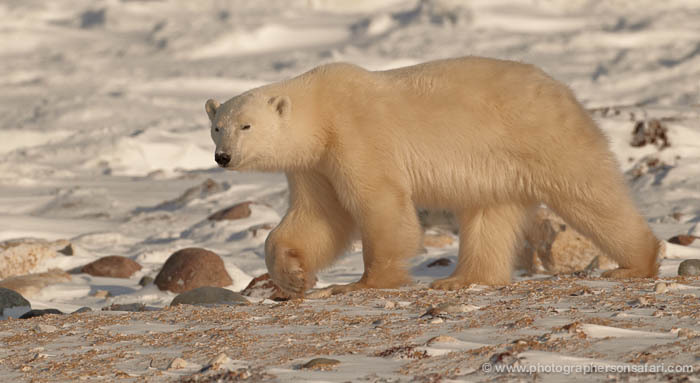 Joining a convoy of tundra buggies, Lawrence heads to Cape Churchill where the polar bears are beginning their journey onto the sea ice. The centre of the bear kingdom is only 30 miles away, but the journey takes nine hours due to the horrendous weather conditions. We travelled with the Tundra Buggy Lodge. What a circus. A string of trailers housing a kitchen, a diner, a meeting room, two bunk houses, a generator and a propane gas trailer for heating. They unhitch them and tow them across the Tundra. It is a wagon train of 35 feet buggies each towing a 40-foot trailer across a bumpy rutted trail. No track – the lead buggy steers by Sat Nav. A howling gale is blowing outside but inside our buggy, which isn’t towing a trailer – it’s as warm as toast because of a huge propane burner. There’s a chemical toilet and plenty of food. The rest of the buggy is like a bus with seats down either side of a wide alley. It’s surreal chugging along on tractor tyres crunching the snow just, but only just seeing the buggy in front. Halfway to the Cape and “Houston we have a problem”. One of the trailers is slipping off its’ chassis. We race up the column (because we’re not towing we’re more manoeuvrable) and side-on, back into the trailer to give it a thwack. It seems to work and we continue but only for a few hundred metres. It’s still slipping. So we give it another thwack, and some mechanical types get out in the snowstorm, hit it with a lump hammer and weld it back on. Technology tends to be simple here because it works. We arrive at Cape Churchill in a blizzard. More than 40 below and horizontal snow and freezing ice (snow on adrenalin). In all this, drivers dismount onto the ground to form up the string of trailers that make the camp, pulling them into place with winches. Guards with shotguns are everywhere looking out for bears. We’re skirting the perimeter looking for bears. We see plenty of tracks and then in the distance pick out a bear. It is too far away to raise the alarm to the men on the ground. But then a bear does get too close and the operation is suspended until it leaves. The lodge is parked on a frozen lake, which has the advantage of being a handy supply of fresh water. But it has the disadvantage of being not an entirely reliable surface. One of the buggies starts to fall through the ice. We stop again and move the whole kit and caboodle to one side. It is 1.30 am by the time they finish. They’ve been on the go since 7 am. So have we. We manage to a report about our journey and send it by satellite back to ITV for the lunchtime News. It’s over and we’re utterly drained. 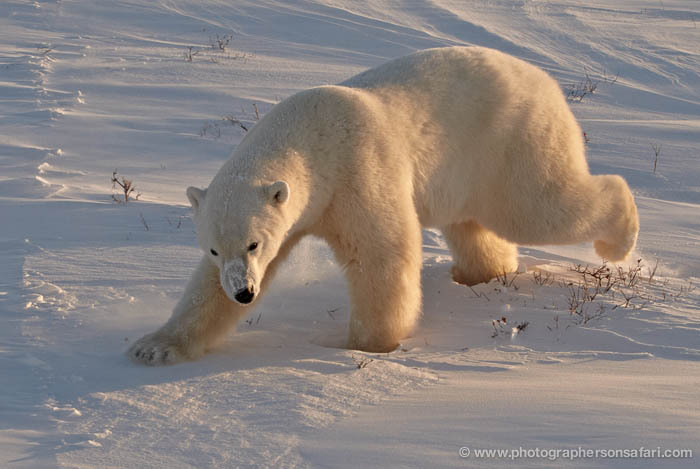 The journey to Cape Churchill was just unbelievable. 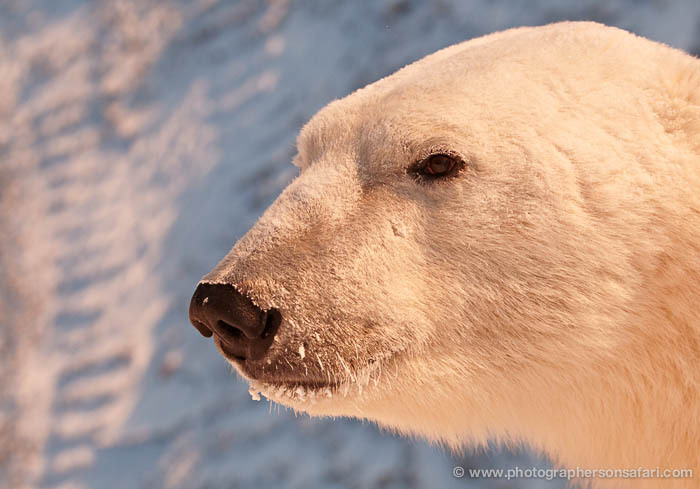 After a fourteen-hour trek, we awake in Manitoba’s best place for viewing large bears – Cape Churchill. 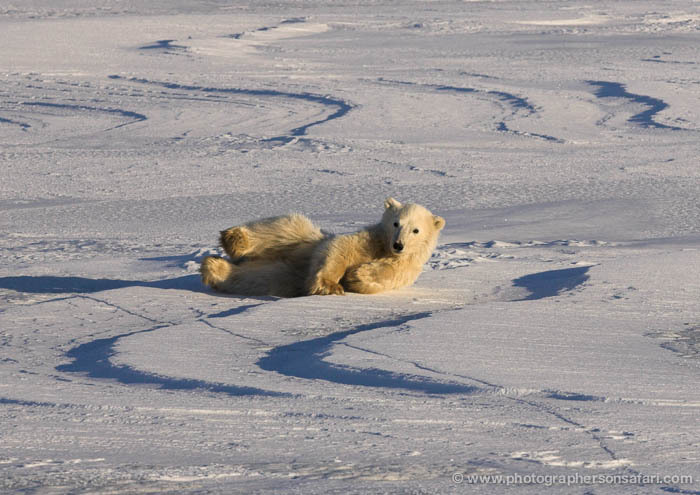 This is the coldest part of the bay, and it’s also the best place for polar bears to head out in pursuit of seals. 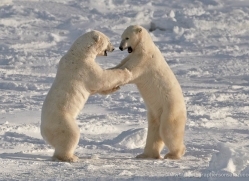 As such, it’s the domain of the largest, most powerful bears in all of Manitoba. 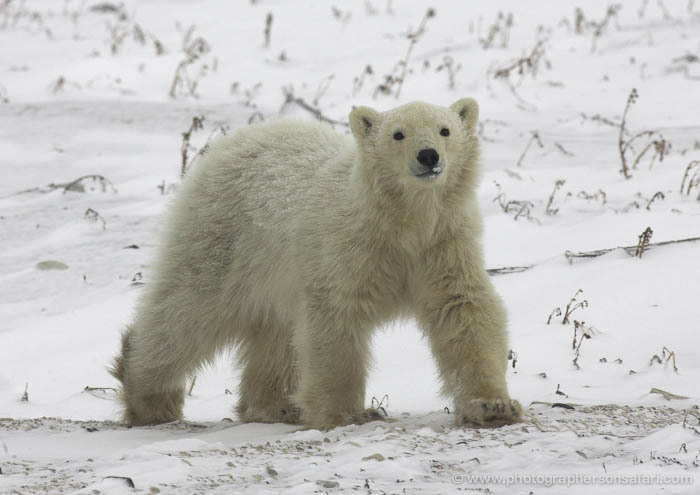 We are with the Tundra Buggy lodge, the outfit that supports the non-profit conservation work of Polar Bears International. 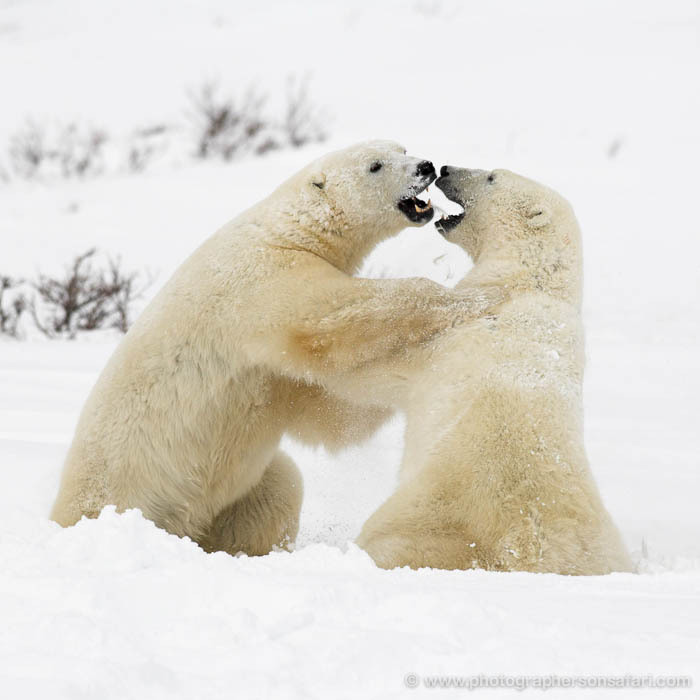 Our work here- along with PBI’s- is to share both the beauty of the bears and conservation information that will help better interpret these amazing animals, their habitat and the stresses upon them. Each day we are filming, editing and posting to the web a new, same-day HD program from the Cape. It’s all free, but we do hope folks will support the non-profit work PBI does for the bears. 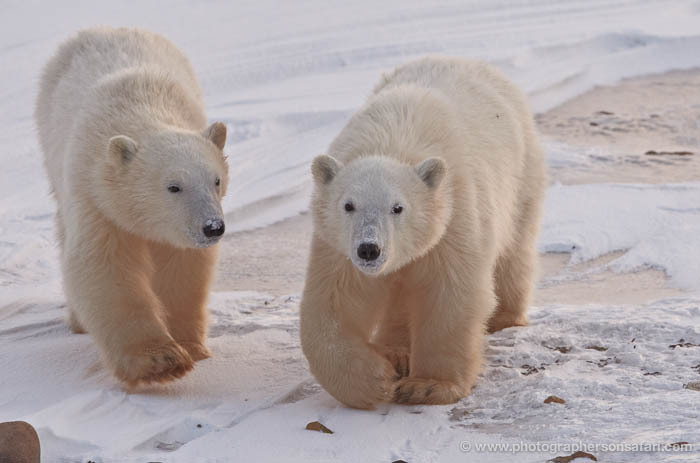 This afternoon, we drive our Tundra Buggy to a group of willows where we find two sleeping polar bears. 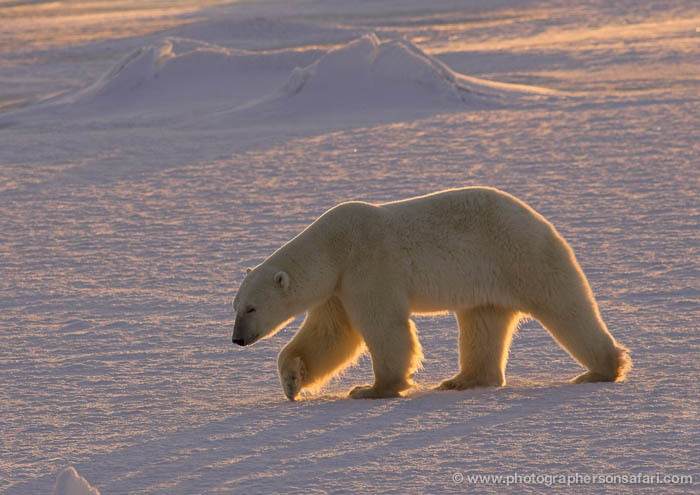 We wait for almost four hours, and just before sunset we discover that in fact there are two more polar bears in the group – they are nearly completely buried in snow. 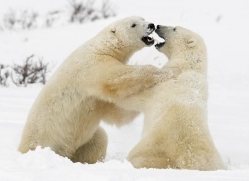 We zoom in on them, and amazingly, we can see that they are taking fewer than four breaths each minute. 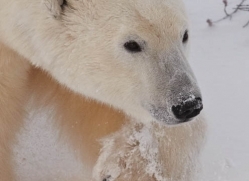 Polar bear researcher Ian Stirling is with us, and he explains that when food is not available, polar bears enter a “walking hibernation” during which time they can slow their heart rate as low as 20 beats per minute and respiration as low as three breaths per minute. See the end of this cold and windy day for yourself. 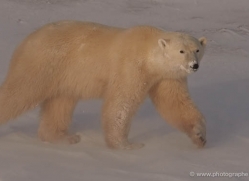 Today we have filmed more bears, edited two more reports, done two live broadcasts to ITV and another two for CNN. At the end, I’m bushed. But then suddenly very emotional because this is Trevor McDonald’s last News at Ten and I’m on it. Trev and I both started on Channel 4 News when it started back in 1982 and it has been a pleasure and an education working with him. At the end I say “and, for the last time, back to you Trevor”. Lump in throat but not for long because the celebrations start. Tundra Buggy people are celebrating because they got to the Cape. We’re celebrating because we’ve done four reports from the Hudson Bay and live reports on the three days they were possible. Several beers disappear, some of them in my vicinity. A bottle of bourbon appears and then disappears. I retire to my bed – a foam mattress on plywood laid along the back of the bus seats. You’ve guessed. In the middle of the night it collapses and I end up with a bruised knee and a bump on the head. It was worth it. At the very tip of Cape Churchill, we see half a dozen heavyweights. These polar bear are healthy and still carry good reserves of fat. 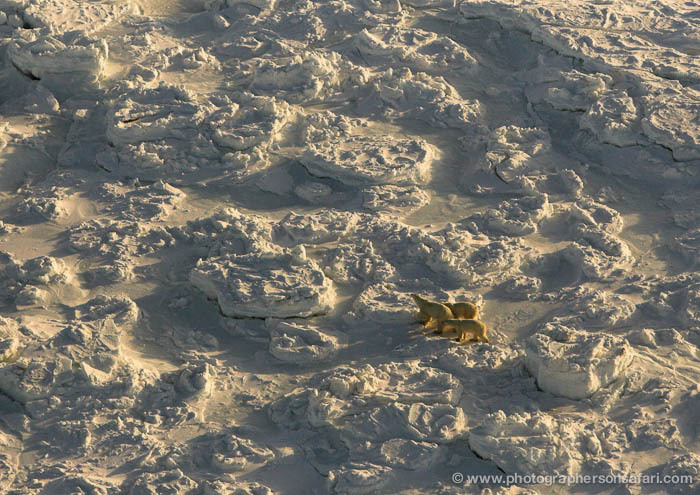 About 10% of Hudson Bay is now frozen, and the bears are ready to head out in search of seals. 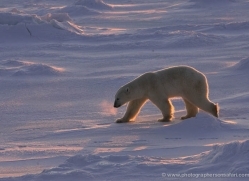 They are restless – walking out to the edge of the ice and then back to shore again to rest. Others are also ready to join them – arctic foxes. Today we see several foxes scurrying around the bears. 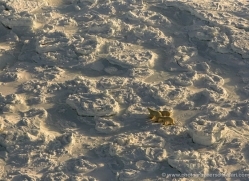 They are looking for food on shore, but they are also only a few days away from their first meals of seal leftovers. 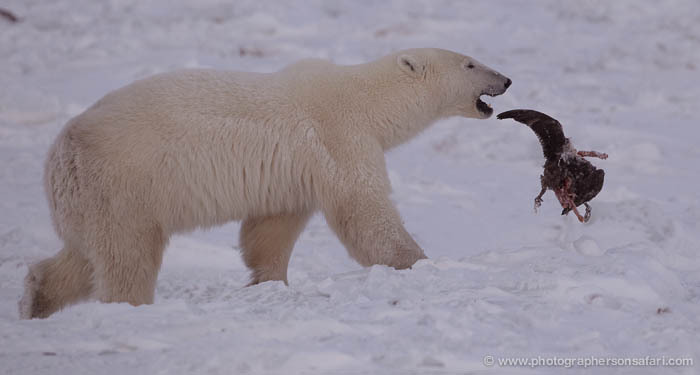 Polar bears provide foxes with nourishment through the winter and spring, and foxes occasionally help polar bears too. 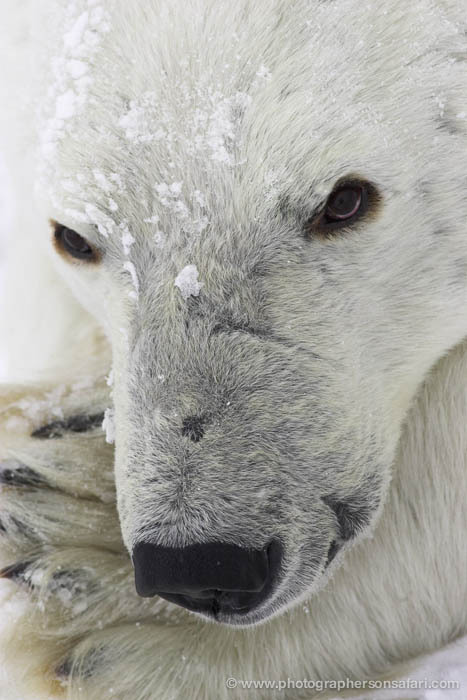 Both animals rely on their sense of smell to survive the winter. Join us for today’s program, we just finished the edit a few minutes ago (it’s a little late because we ran out of gas out on the tundra! ), but it’s now ready for viewing. We wake to a strong south wind that is blowing snow across the tundra. It’s also blowing ice away from shore. 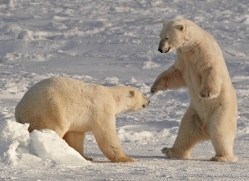 Bears that are already on the ice are being carried closer to seals. Those still on shore will need to wait for cold, calm weather or for the winds to blow on shore. Hudson Bay is warmer now than it was twenty years ago, and as a result, much colder weather is required to freeze the surface water. For polar bears, the delay is serious, and it is resulting in an average decline of over one percent per year for the Hudson Bay population (22% decline since 1987). Unless the climate cools, the polar bear population here is in trouble. 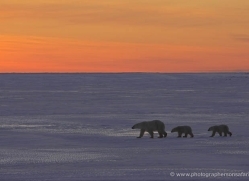 Late in the day we see several mothers and cubs walking back from the ice. The open water has deterred them from heading out into the bay. Most have stopped nursing because their fat reserves are gone. 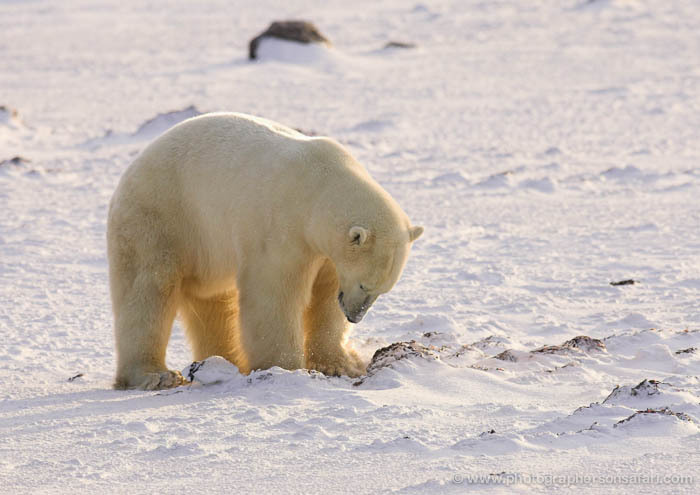 Today’s loss of ice creates an additional stress, because now they must return to the Cape and work to avoid some very large and hungry bears. A light south wind continues to blow, and the temperature has increased. Significant amounts of ice have disappeared from Hudson Bay. 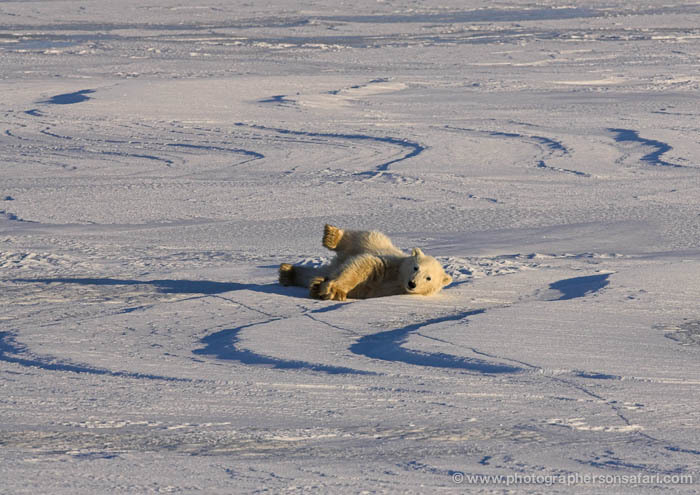 Any polar bears that are not already on ice in the middle of the bay will stay ashore for many more days. 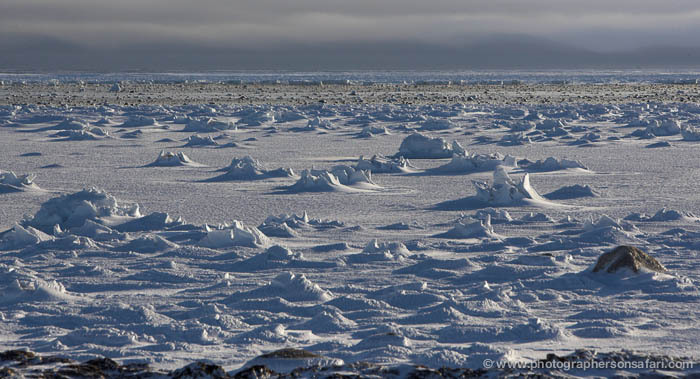 The forecast calls for at least a week of weather that’s not favourable for ice formation. 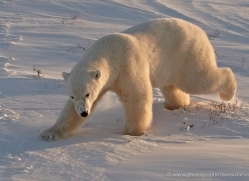 On this last day of our 2008 expedition, we find more than a dozen bears on the tundra. 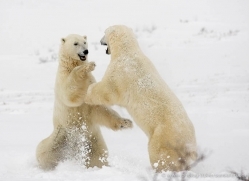 Many of these are large males, and two are doing a two-step dance in which one is working hard to avoid a dangerous fight. 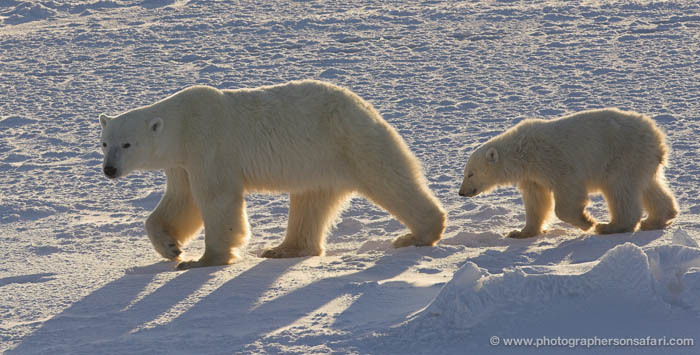 We also follow a female and cub who work continuously to avoid the large bears. 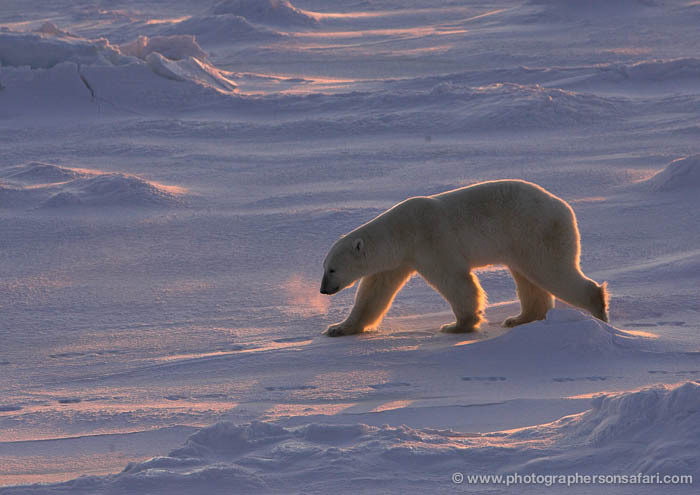 The female is burning up precious energy trying to keep herself and her cub safe. 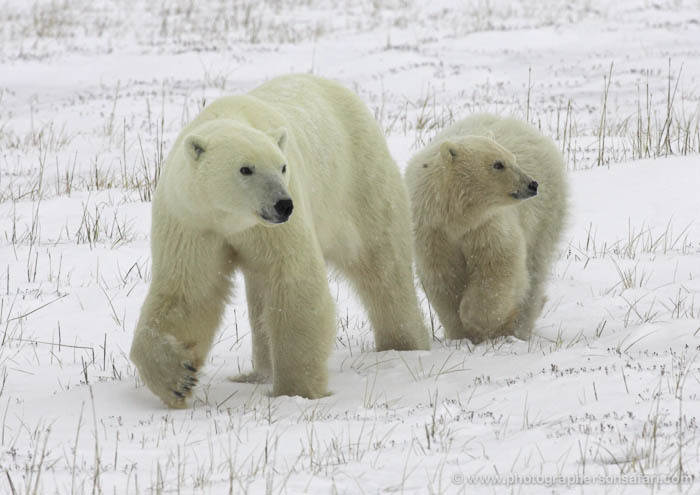 She is thin and is likely no longer able to nurse her cub. 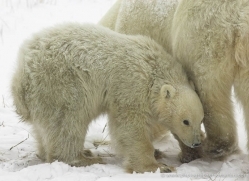 The female must reach seals within three to four weeks or face starvation – for both her and her cub. Unfortunately, the weather forecast calls for more warm weather and another south wind. 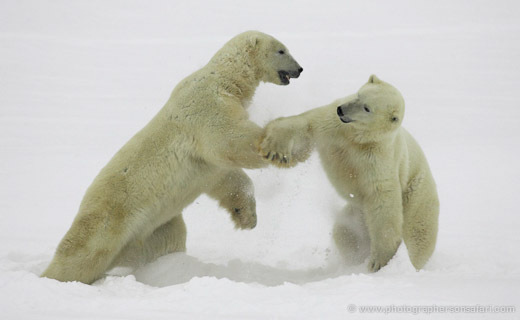 This is the end of our time on the tundra for 2008. 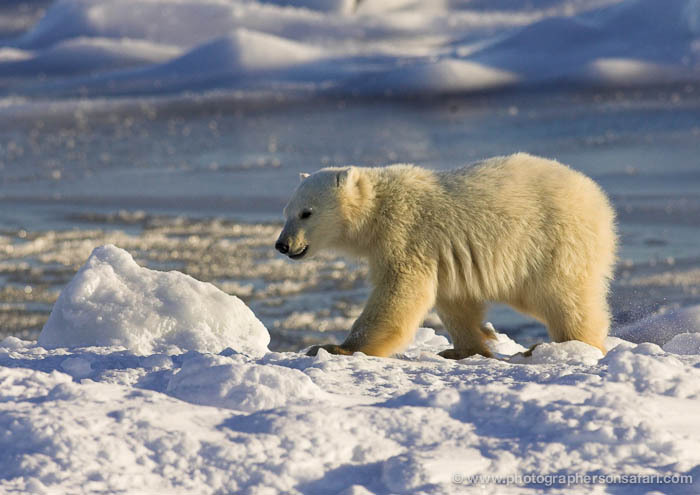 The polar bear is found throughout the Arctic Ocean and adjacent seas. It is the world’s largest land predator, twice the size of a Siberian tiger, and migrates huge distances in search of food. 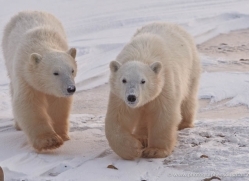 The five areas in which the bears are found are; Alaska, Canada, Russia, Greenland and Norway. 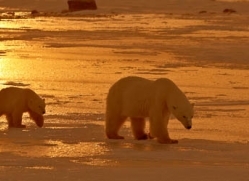 Canada’s Hudson Bay population has dropped 22% since the early 1980s. 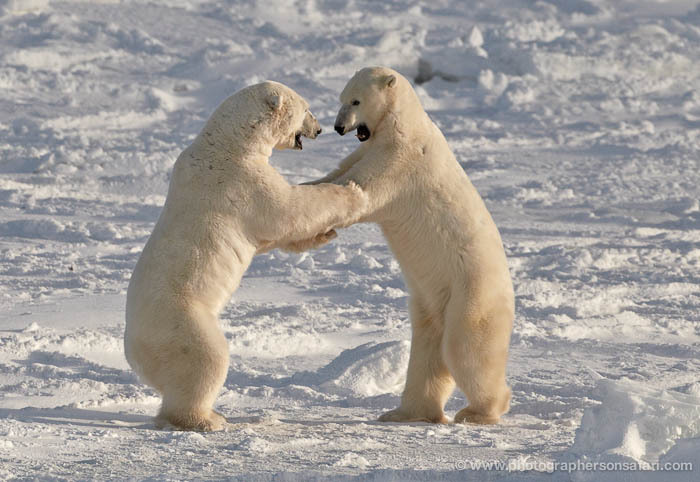 Their decline has been directly linked to an earlier break-up, and a later freezing of the ice. 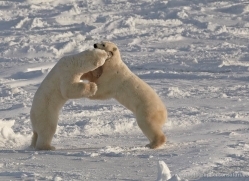 A diminishing ice pack directly affects polar bears, as that is the platform they need from which to hunt seals. 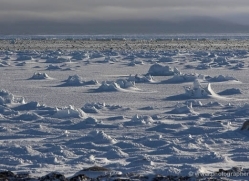 Although the Arctic has experienced warm periods before, the present shrinking of the Arctic’s sea ice is both rapid and unprecedented. 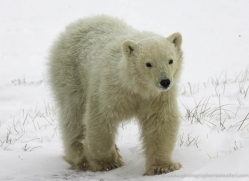 Scientists predict that, if current rate of warming continues, two-thirds of the world’s polar bears could be lost by 2050. 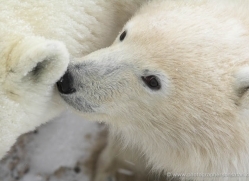 Seals are the polar bears’ primary prey and the polar bear’s nose is powerful enough to detect food several miles away. 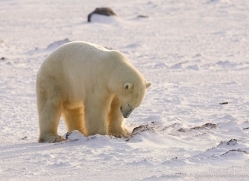 When hunting is good, the bears will typically eat only the fat of the seal, and leave the rest of the carcass for scavengers – the likes of arctic foxes, ravens, and younger bears. 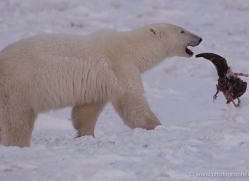 When times are hard, polar bears will eat walrus, beluga whales and other foods including birds, eggs, kelp, and beached whales. In summer, when the ice retreats northwards, they will travel hundreds of miles to stay with their food source. 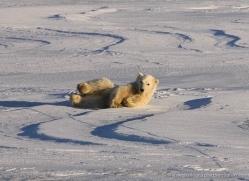 The bears that find themselves stranded on land in summer must stay there until the ice forms again in the autumn. 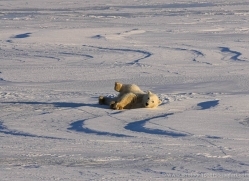 They face very hard times, since they are rarely able to catch seals unless they are trapped beneath the ice. 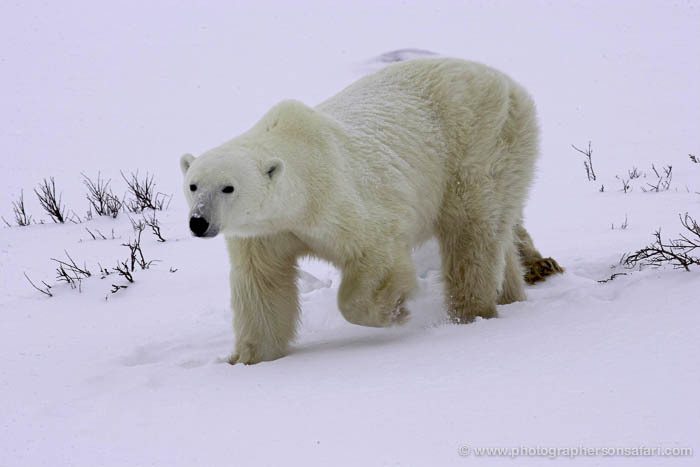 Adult male polar bears are typically up to 8 to 10 feet tall and weigh between 5 and 15 cwt. The females are smaller, 6 to 8 feet tall and weighing 2 to 6 cwt. 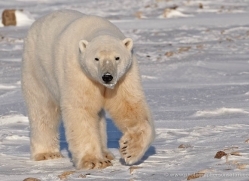 Polar bears are perfectly adapted to survive in the harsh conditions of the Arctic, where winter temperatures can plunge to minus 50 degrees Centigrade for several weeks at a time. A layer of blubber up to 4 inches thick and two layers of fur provide them with such good insulation that they experience virtually no heat loss. 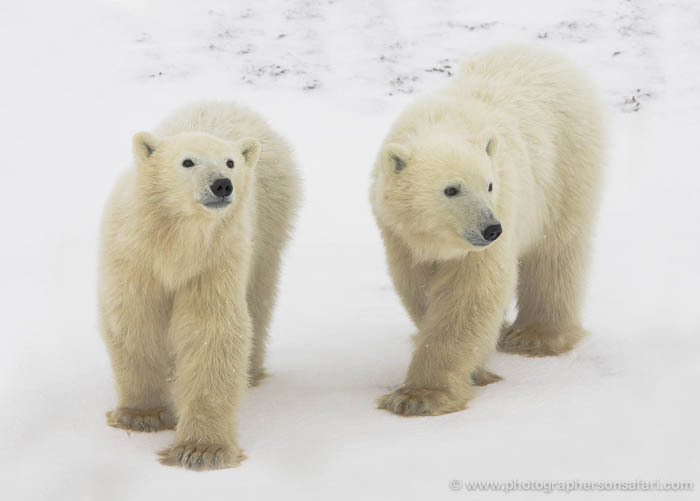 Amazingly, they are so well protected from the cold that they have more problems with overheating than they do with the cold. 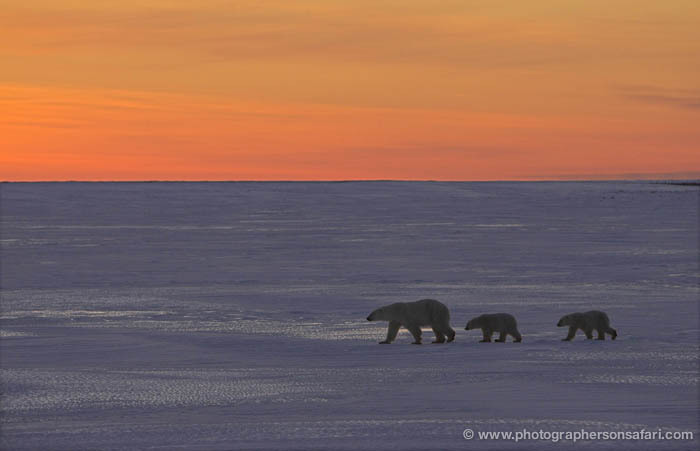 In the intense cold of the high arctic, the sun sets in October and does not rise again until late February. 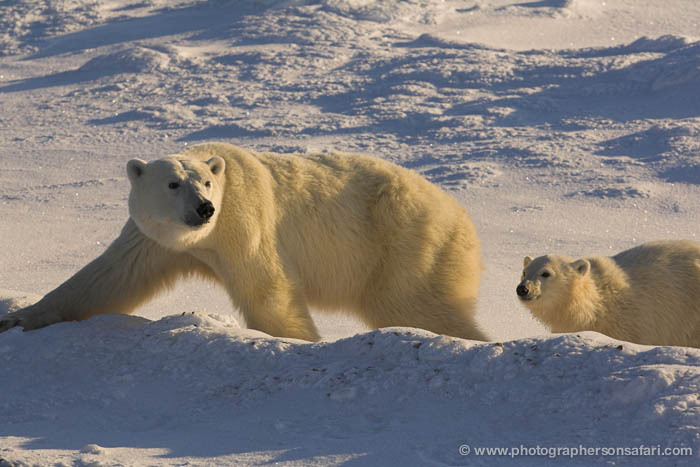 Female polar bears have their first set of cubs between the ages of four and eight. 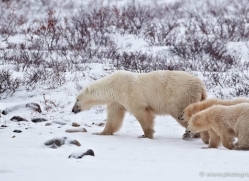 There are usually two cubs in a litter, and females typically produce five litters in their lifetime. After mating in April or May, the fertilized egg remains in a suspended state until August or September. During these four months, the pregnant female eats huge amounts of food, gaining up to 4cwt, and often more than doubling her body weight. If her bodyweight is not sufficient the embryo will die. 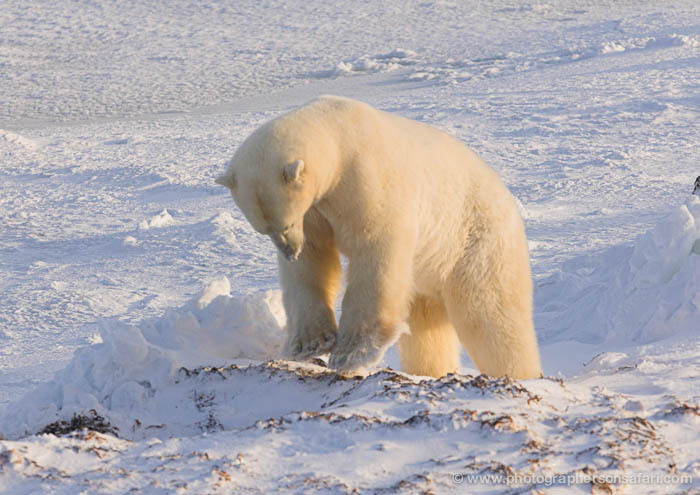 In October or November, a pregnant female polar bear will dig herself a den. Most choose den sites in snowdrifts along mountain slopes or hills near to the ice, although some dig their dens in snow drifts out on the sea ice. 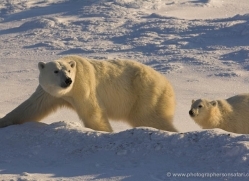 The cubs are born in November or December and remain in the den until March or April. During that time, the mother does not eat, drink, or even defecate. The cubs, weighing one pound at birth, are blind and without teeth. They grow rapidly while they are in the den, thanks to their mother’s incredibly rich milk. 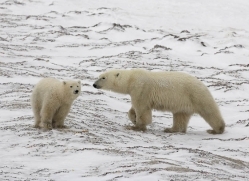 Polar bear cubs normally stay with their mother until they are two and a half years old, learning how to hunt and survive in one of the world’s harshest environments. 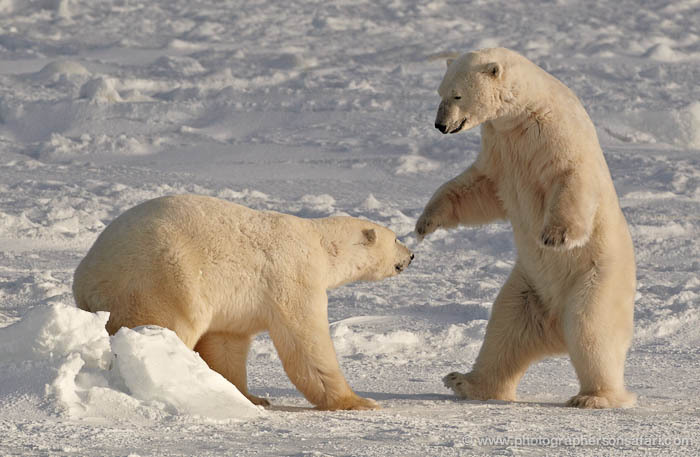 In the wild, the average life of a polar bear is between 15 and 18 years. 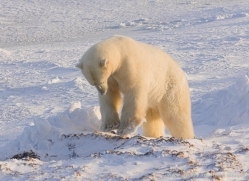 Polar bears, unlike other bears, do not hibernate. 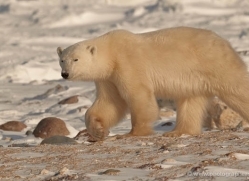 They do, however, have the ability to turn on their “walking hibernation mode” when food is scarce and to turn it off when food becomes more abundant. 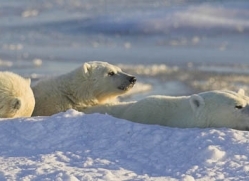 In Canada’s Hudson Bay the ice now melts completely in summer, forcing the bears to spend more and more time on shore until the autumn freeze-up. 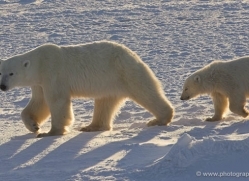 Polar bears must now fast for a minimum of four months until they can resume their hunting. 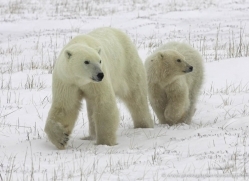 Incredibly, females with new-born cubs have already fasted for eight months until this time. 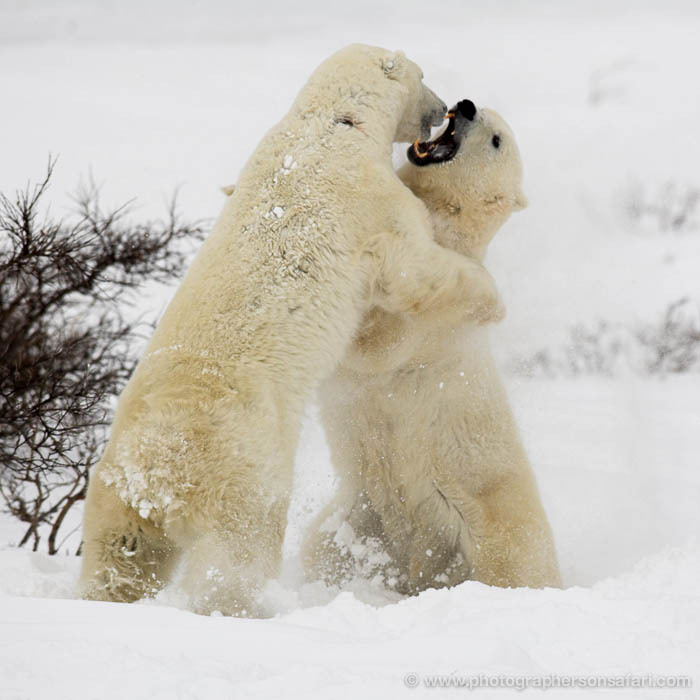 The trend towards earlier break-up of the sea ice has had significant effects on the polar bears of Hudson Bay. It now occurs about three weeks earlier than it did thirty years ago. 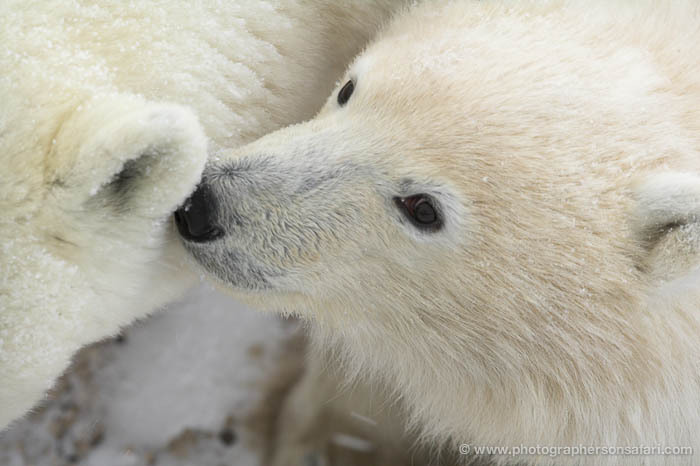 The most important time for polar bears to feed is from late spring to ice break-up, when the newly weaned seal pups are abundant. 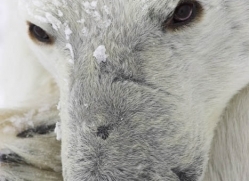 These seal pups are still unaware of their predators and contain some 50% fat, – an ingredient that is absolutely vital to the bears’ survival. 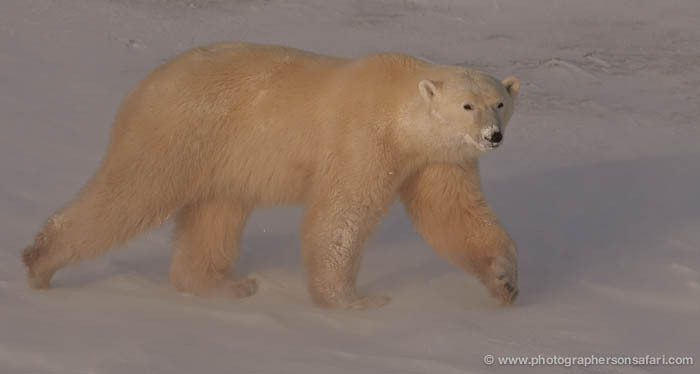 Over the last 30 years the polar bears in Hudson Bay have been forced to abandon hunting seals on the sea ice at this most important time of year, and to begin their fast on land at progressively earlier dates. 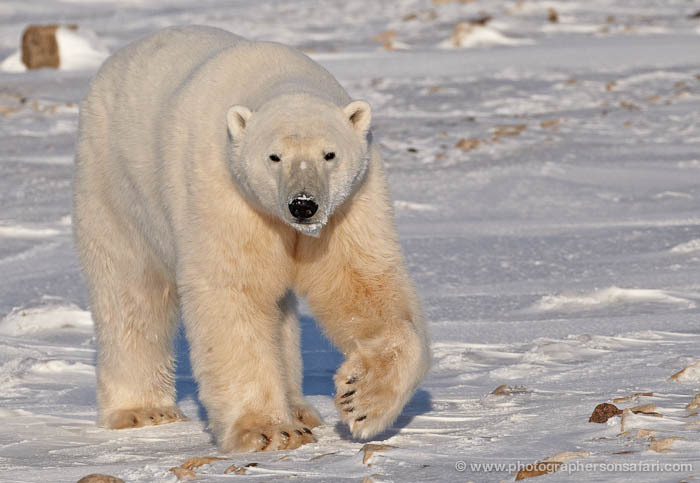 As a consequence, the average weight of an adult female polar bear has reduced by about 20% from 290 kg to 230 kg. It is believed that no female will reproduce if that average weight were to fall another 10% to 190kg. 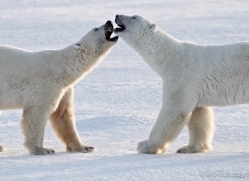 It has also been clearly shown that the recent decline in survival of cubs and sub adults was significantly linked to earlier break-up dates. The Hudson Bay freeze-up arrived later this year, with open water still in most of the bay long after the usual time of ice formation. 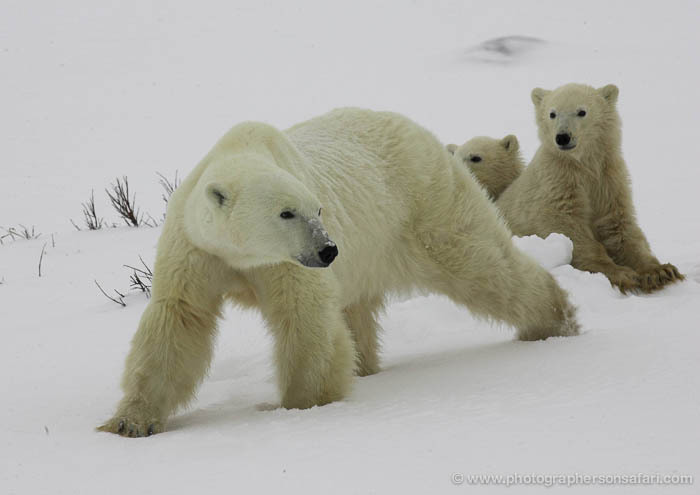 At least twenty polar bears were still at Cape Churchill at the end of November, – not a normal occurrence. 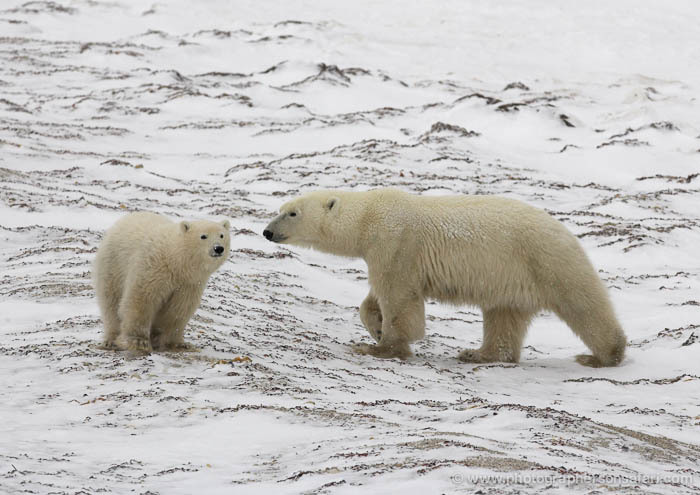 The longer the freeze-up is delayed, the thinner and hungrier the bears become, and some of the female polar bears with cubs at Cape Churchill were noticeably thinner this year. They were unable to rest and conserve energy because they were being continually harassed by adult males, intent on killing their cubs. Some of the smaller cubs were close to exhaustion and laid down at every opportunity. It was obvious that their mother’s milk supply had long since been exhausted. Only about 50% of cubs now make it to their first birthday and a mother and two older cubs is an increasingly rare sight. 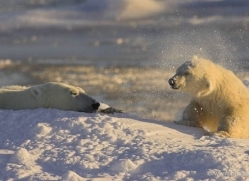 A northwest blizzard finally blew into Churchill in early December and colder temperatures allowed the ice to form. 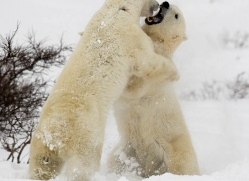 The remaining bears were now at last able to commence hunting seals. 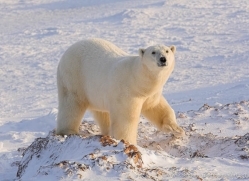 The freeze-up date was two to three weeks later than it was just twenty years ago and, coupled with the two to three weeks earlier break-up of the sea ice, has vastly shortened the hunting season for the Hudson Bay polar bear population.